Mononoke is not my favorite of Ghibli’s films — I think it’s a little shallow, and it’s a little slow, and it just doesn’t suit my taste. That said, it is still quite deserving of its place as one of Ghibli’s hallmark films. It is an imaginative, adventurous story full of interesting and bizarre animation, and fun to watch. It’s Miyazaki, which is always good. Joe Hisaishi wrote the lovely, epic-style score. I couldn’t find an English dub version, so I’m not sure how the voice acting might compare to other animated films. (I doubt if this ever had a Disney release … since people’s heads and arms fly off pretty often and whatnot.) Overall, it’s very well-made and enjoyable. I’m just not head-over-heels with this one like I am with many Ghibli films. 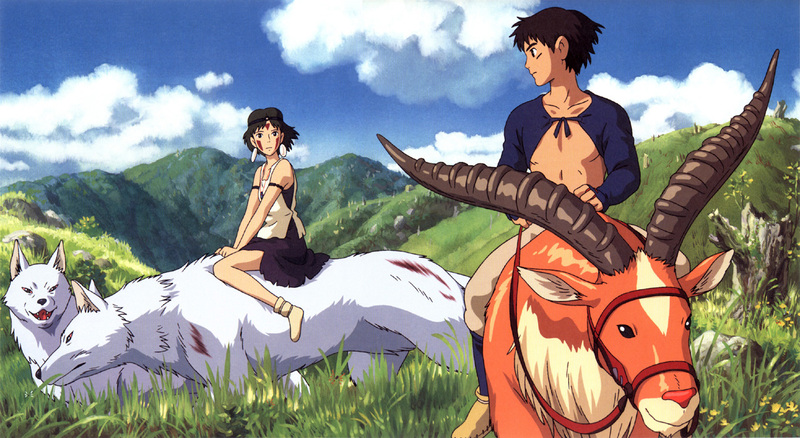 I’m not sure what the difference is, but for some reason Mononoke just doesn’t spark my imagination like the others, and I don’t feel as strong of a connection to the film as I do to many others. It’s your typical “save the forest from evil humans” kind of thing, which I have no problem with. There are interesting forest gods in the shape of animals that talk. As if to make up for Porco Rosso‘s chauvinism, Mononoke is a crazy girl power film, complete with a femi-nazi iron making town full of women who mock and degrade the inept men. I prefer Porco, but whatever. 🙂 The film just doesn’t seem to me to have much of substance to say, so even though it’s enjoyable, I find it a little boring at times, and not intriguing enough to make it a favorite.